Two millennials walk into a bar and ask for alcohol-free drinks. The bartender stares at them, dumbfounded. Lately a string of articles from The Atlantic to The Guardian have suggested that alcohol use is falling among young people — that they’re drinking less frequently compared to previous generations. There aren’t too many solid statistical indicators just yet. But the pace at which Big Alcohol is injecting non-alcoholic beverages into its portfolio does point to the emergence of a teetotaler trend. Heineken, Brooklyn Brewery and PBR are already out with their own low- to zero-ABV beers. Trendy new gin alternatives like Seedlip, Ceder’s and Stryyk aim to change our view of conventional cocktails, thriving in a market projected to grow by 32% between 2008 and 2022. 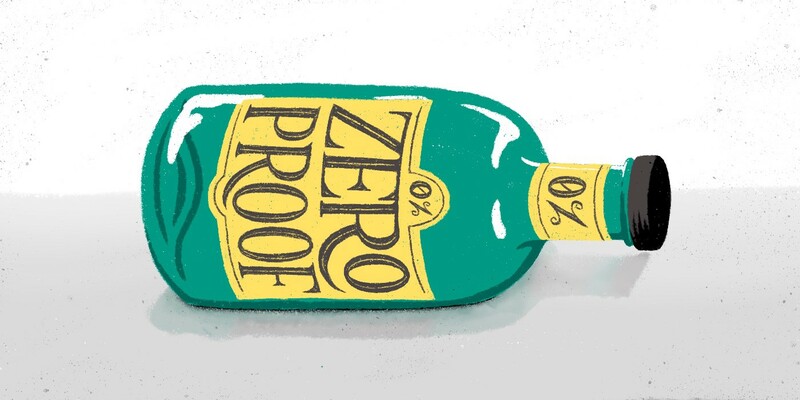 What’s the point of booze-free booze anyway, and why are young people thinking before they’re drinking? This commercial shift away from intoxicants isn’t entirely unprecedented in our current wellness-driven, healthier-than-thou culture. It’s the same reason we skip a night out to attend yoga the next morning, order desk lunch from bougie salad chains, declutter with the KonMari method and have dreams/nightmares about Gwyneth Paltrow teaching us how to kegel with jade eggs. (Maybe that last one is just me.) People are also trying to find better alternatives to soda pop and syrupy drinks. That’s how brands peddling seltzer, kombucha or anything infused with CBD have built a cult-like following. Now there’s always something in the water. It was only a matter of time before the wellness contagion and you-are-what-you-drink mindset spread to alcohol: a defining social activity of almost every major culture. “Sober curious” is on everyone’s lips at the moment. Author Ruby Warrington’s latest book documents a growing “mindful” drinking movement in the US, led mostly by young professionals in major cities like New York and Chicago interested in experimenting with abstinence. This isn’t to say that sober curiosity is the same as sobriety. Alcoholism is a serious affliction that requires proper treatment and rehab. There’s no quitting cold turkey or 12 steps to recovery involved. The operative word here is wellness. So low the new high? Let’s not kid ourselves. Just because we might be drinking less doesn’t mean we don’t enjoy drinking. Alcohol has been around since our primitive ancestors discovered they could safely consume fermented rotten fruit off the forest floor more than 10 million years ago. But it’s hard to be sober-curious in a culture so heavily centered on alcohol as the Great Social Lubricant — helping fuel rituals, celebrations, friendships and even creativity. “Alcohol is the only drug you have to apologize for not taking,” says Adrian Chiles in Drinkers Like Me, a BBC2 documentary outlining the dangers of social drinking. How many times have you gotten a collective groan for teetotaling in social settings? You shouldn’t have to explain why you don’t drink alcohol, just as vegans don’t have to explain why they don’t eat animal products — although they’re happy to. The drinking model needs to be reimagined for a new generation and adapted to all types of audiences — designated drivers, expecting mothers, calorie-watchers, recovering addicts, or just about anyone trying to have a non-judgemental non-alcoholic experience. The growing popularity of zero-proof beverages and resolutions to reduce alcohol intake calls for a sea change in how Big Alcohol thinks about wellness and non-drinkers. Bartenders and beverage directors everywhere are expected to raise the bar. For one, we could stop calling them “mocktails.” Nobody likes to feel patronized when ordering an n/a drink, especially when all they get in return is a sugary, subpar concoction. A mocktail is in effect faced with the same destigmatizing challenge as decaf coffee or plant-based meat. Everybody likes a strong cocktail, but it doesn’t mean an alcohol-free one deserves any less fanfare. New n/a aperitifs like Æcorn, Three Spirit and Everleaf have been designed around cleansing the palate or exciting the appetite. At the recently restored Chicago Athletic Association Hotel, rooftop bar Cindy’s replaced the word mocktail on its menu with “spirit-free” to invoke thoughtfulness and sophistication. Bars and restaurants also have the opportunity to design and integrate subtle symbols for n/a options with the rest of the bar menu, in the same way most American restaurants don’t discriminate against vegetarian dishes. It’s all about experience, experience, experience. Portland, Oregon-based Andy Ricker recently rebranded drinking vinegar Som to a premium “non-alcoholic cane sugar cordial.” Soda may be for gulping, but Som is for sipping and savoring. The packaging was made more desirable through the shape of the bottle itself — a slim container designed for the bartender to fit in the speed rack or the back bar so it can sit squarely next to traditional liquors, waiting to be beckoned. Soberville is getting an upgrade. Hip new booze-free bars in New York like Greenpoint’s Getaway, Nymphaea at the Assemblage and the monthly-party throwing Listen Bar elevate zero-proof drinks to an inclusive, enjoyable experience. As part of her exploration of sober curiosity, Ruby Warrington also started Club SÖDA NYC (Sober or Debating Abstinence). The sober social community regularly hosts a series of speakeasy-like meetups, talks and parties that put the happy in happy hour and bring more awareness to different ways of winding down without alcohol. The fear of missing alcohol, as Warrington puts it, is real. Truth is, in an always-on 24/7 culture, everybody needs to let go sometimes. So what do we replace it with? Our drinking-centered culture is confronted with the challenge of conquering FOMA. Now that the non-alcoholic floodgates have opened, it’s time to rethink our relationship with relaxation and redefine the teetotal trend. Until then you’ll find us scouring cocktail menus in Manhattan bars to get our zero-proof fix. You know, in the spirit of inclusivity. This post was written by Shivani Gorle, with thinking contributed by Dylan Stiga. ThoughtMatter is a creative branding, design and strategy studio in New York City’s Flatiron District. Find us on Twitter.